Errata & Corrigenda now available as freely downloadable PDFs. ERIC II receives Honorable Mention in ForeWord Magazine's 2011 Book of The Year awards. Review in the Numismatic Bibliomania Society's E-Sylum newsletter. Although twice the page count of the 2005 edition, ERIC II is not just an extension of its predecessor. It is a fundamental revision and scope expansion, including 60,000 entries that incorporate essential numismatic esoterica. The foremost subject resource since H. Cohen’s eight-volume Description historique des monnaies frappes sous l’Empire Romain of 1880-1892, ERIC II covers the 1500-year period between Augustus and the 1453 fall of Constantinople. Opening with an informative introduction that explains denominations and mint marks, Suarez (ERIC I) divides his subject into 15 chronologically organized chapters, surveying the ruling culture and detailing each imperial coin’s minted permutations. An absolutely vital guide for numismatists. I must begin by saying this massive book is an impressive piece of work. Writing an encyclopedia is a daunting task, especially for an enormous area of study that is not well understood and is constantly changing. But Mr. Rasiel Suarez has proven that it can be done by abandoning the standard encyclopedia format, the usual alphabetical listing of facts, in favor of a well illustrated compendium. And Mr. Suarez has done it with intellectual comprehension, with great flair, and at a very reasonable cost. 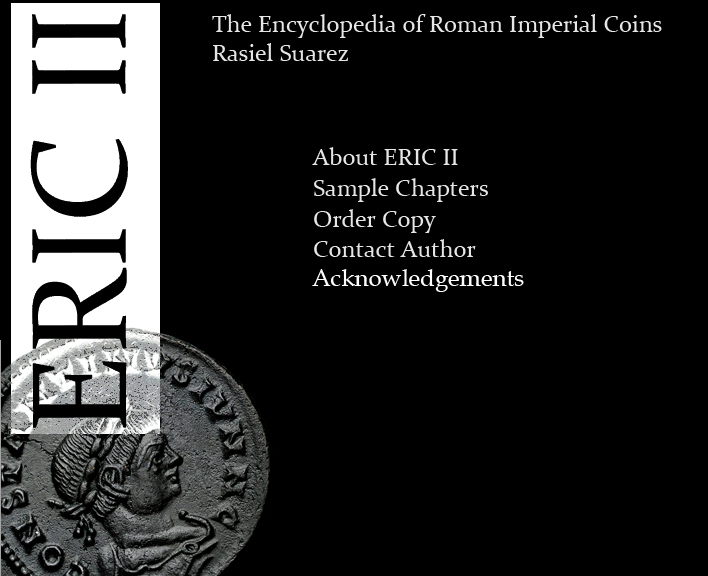 His newly revised second edition of ERIC, Encyclopedia of Roman Imperial Coins, titled ERIC II, is currently the best single volume, illustrated study of this complicated subject. It will appeal to coin collectors, artists interested in coin art, archaeologists, historians, students of economics, and to numismatic and historical fiction authors or to anyone with “a love of learning”. Coins are mirror reflections of the civilization that minted them and the format of ERIC II conveys this concept very clearly. The introduction succinctly presents the groundwork for the study of the coins by giving explanations of the denominations, mint marks, a rarity and pricing scale, and a guide to coin identification. The book contains more than 60,000 coins, listed chronologically by ruler from Augustus, 27 BC to the Byzantine emperor, Constantine XI, AD 1453. These are accompanied by a brief biography and a color photo of an image of the personality responsible for issuing the coins. This is followed by a description of the various coin types and mints, then a full catalog of the coins, each one cross referenced to major catalogs. The coin photos are of the highest quality and gathered together on the pages so that they give a ‘rogues gallery’ of images that can be compared at a glance. Scattered throughout the text are interesting sections, similar to footnotes, with text and color photos giving the highlights or context of the rulers career or their influence on history. These are written in a breezy scholarly style that humanizes the character being discussed. I have only two quibbles about ERIC II. The Bibliographies are skimpy and the Glossary of Coin Terms is too short for an educational book. But these two items, if done fully, would fill another book of the same size as ERIC II, and maybe Mr. Suarez is working on it at this moment.